Clusters of yellow lights on the Indo-Gangetic Plain reveal numerous cities large and small in this astronaut photograph of northern India and northern Pakistan, seen from the northwest. The orange line is the India–Pakistan border. The Indo-Gangetic Plain, also known as the Indus-Ganga Plain and the North Indian River Plain, is a 630-million-acre (2.5-million km2) fertile plain encompassing northern regions of the Indian subcontinent, including most of northern and eastern India, the eastern parts of Pakistan, virtually all of Bangladesh and southern plains of Nepal. The region is named after the Indus and the Ganges rivers and encompasses a number of large urban areas. The plain is bound on the north by the Himalayas, which feed its numerous rivers and are the source of the fertile alluvium deposited across the region by the two river systems. The southern edge of the plain is marked by the Chota Nagpur Plateau. On the west rises the Iranian Plateau. The region is known for the Indus Valley Civilization, which was responsible for the birth of ancient culture of the Indian subcontinent. The flat and fertile terrain has facilitated the repeated rise and expansion of various empires, including the Magadha dynasties, Imperial Kannauj, the Mughal Empire and Maratha Empire – all of which had their demographic and political centers in the Indo-Gangetic plain. During the Vedic and Epic eras of Indian history, this region was referred to as "Aryavarta" (Land of the Aryans). According to Manusmṛti (2.22), 'Aryavarta' is "the tract between the Himalaya and the Vindhya ranges, from the Eastern Sea (Bay of Bengal) to the Western Sea (Arabian Sea)". The region is referred to as "Hindustan" (Land of the Indus), deriving from the Persian term for the Indus River. This term was later used to refer to the whole of the Indian subcontinent. The term "Hindustani" is also used to refer to the people, music, and culture of the region. Some geographers subdivide the Indo-Gangetic Plain into several parts: the Gujarat, Sindh, Punjab, Doab, Rohilkhand, Awadh, Bihar, Bengal and Assam regions. In India, the plains extend from Gujarat, Rajasthan and Punjab on the west to West Bengal on the east. Parts of Gujarat and Rajasthan lie on the Indus plains whereas the rest of the area falls within the plains of Ganges and Brahmaputra. 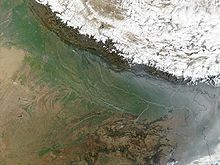 By another definition, the Indus-Ganga Plain is divided into two drainage basins by the Delhi Ridge; the western part consists of the Punjab Plain, and the eastern part consists of the Ganga–Brahmaputra drainage systems. This divide is only 350 metres above sea level, causing the perception that the Indus-Ganga Plain appears to be continuous from the Yamuna River in the west to the state of West Bengal and Assam in the east. The Lower Ganges Plains and the Assam Valley are more verdant than the middle Ganga plain. The lower Ganga is centered in West Bengal, from which it flows into Bangladesh. After joining the Jamuna, a distributary of Brahmaputra, both rivers form the Ganges Delta. The Brahmaputra rises in Tibet as the Yarlung Zangbo River and flows through Arunachal Pradesh and Assam, before crossing into Bangladesh. and the Brahmaputra Valley in the East. The fertile Terai region is spread across Southern Nepal and Northern India along the foothills of the Himalayas. The rivers encompassed are the Beas, the Chambal, the Chenab, the Ganga, the Gomti, the Indus, the Ravi, the Sutlej and the Yamuna. The soil is rich in silt, making the plain one of the most intensely farmed areas of the world. Even rural areas here are densely populated. The Indus–Ganga plains, also known as the "Great Plains", are large floodplains of the Indus, Ganga and the Brahmaputra river systems. They run parallel to the Himalaya mountains, from Jammu and Kashmir and Khyber Pakhtunkhwa in the west to Assam in the east and draining most of Northern and Eastern India. The plains encompass an area of 700,000 km2 (270,000 sq mi) and vary in width through their length by several hundred kilometres. The major rivers of this system are the Ganga and the Indus along with their tributaries; Beas, Yamuna, Gomti, Ravi, Chambal, Sutlej and Chenab. The Bhabar belt is adjacent to the foothills of the Himalayas and consists of boulders and pebbles which have been carried down by the river streams. As the porosity of this belt is very high, the streams flow underground. The bhabar is generally narrow about 7–15 km wide. The Terai belt lies next to the Bhabar region and is composed of newer alluvium. The underground streams reappear in this region. The region is excessively moist and thickly forested. It also receives heavy rainfall throughout the year and is populated with a variety of wildlife. The Bangar belt consists of older alluvium and forms the alluvial terrace of the floodplains. In the Gangetic plains, it has a low upland covered by laterite deposits. The Khadar belt lies in lowland areas after the Bangar belt. It is made up of fresh newer alluvium which is deposited by the rivers flowing down the plain. The Indus-Ganga belt is the world's most extensive expanse of uninterrupted alluvium formed by the deposition of silt by the numerous rivers. The plains are flat and mostly treeless, making it conducive for irrigation through canals. The area is also rich in ground water sources.The plains are the world's most intensely farmed areas. The main crops grown are rice and wheat that are grown in rotation. Others include maize, sugarcane and cotton. The Indo-Gangetic plains rank among the world's most densely populated areas with a total population exceeding 400 million. Until recent history, the open grasslands of the Indus-Ganga Plain were inhabited by several large species of animal. The open plains were home to large numbers of herbivores which included all three of the Asian rhinoceros (Indian rhinoceros, Javan rhinoceros, Sumatran rhinoceros). The open grasslands were in many ways similar to the landscape of modern Africa. Gazelle, buffalo, rhinos, elephants, lions, and hippo roamed the grasslands as they do in Africa today. Large herds of Indian elephants, gazelles, antelopes and horses lived alongside several species of wild cattle including the now-extinct aurochs. In the forested areas there were several species of wild pig, deer and muntjac. In the wetter regions close to the Ganga, there would have been large herds of water buffalo grazing on the riverbanks along with extinct species of hippopotamus. So many large animals would have supported a large population of predators as well. Indian wolves, dholes, striped hyenas, Asiatic cheetahs and Asiatic lions would have hunted large game on the open plains, while Bengal tigers and leopards would stalk prey in the surrounding woods and sloth bears hunt for termites in both of these areas. In the Ganges there were large concentrations of gharial, mugger crocodile and river dolphin controlling fish stocks and the occasional migrating herd crossing the river. Farming on the Indus-Ganga Plain primarily consists of rice and wheat grown in rotation. Other crops include maize, sugarcane, and cotton. The main source of rainfall is the southwest monsoon which is normally sufficient for general agriculture. The many rivers flowing out of the Himalayas provide water for major irrigation works. Due to a rapidly growing population (as well as other factors), this area is considered at high risk for water shortages in the future. The area constitutes the land between the Brahmaputra River and the Aravalli Range. The Ganga and other rivers such as the Yamuna, the Ghaghara and the Chambal flow through the area. Because it is not fully possible to define the boundaries of the Indo-Gangetic Plain, it is also difficult to give an exact list of which administrative areas are part of the plain. ^ Taneja, Garima; Pal, Barun Deb; Joshi, Pramod Kumar; Aggarwal, Pramod K.; Tyagi, N. K. (2014). Farmers preferences for climate-smart agriculture: An assessment in the Indo-Gangetic Plain. Intl Food Policy Res Inst. p. 2. ^ Gopal, Madan (1990). K.S. Gautam (ed.). India through the ages. Publication Division, Ministry of Information and Broadcasting, Government of India. p. 70. ^ Michael Cook (2014), Ancient Religions, Modern Politics: The Islamic Case in Comparative Perspective, Princeton University Press, p. 68: "Aryavarta ... is defined by Manu as extending from the Himalayas in the north to the Vindhyas of Central India in the south and from the sea in the west to the sea in the east." ^ "India". CIA – The World Factbook. Archived from the original on 2008-06-11. Retrieved 2007-12-14. ^ "Hindustani Classical Music". Indian Melody. Archived from the original on 2007-12-11. Retrieved 2007-12-14. ^ Ramaswamy R Iyer, ed. (11 April 2009). Water and the Laws in India. SAGE Publications. pp. 542–. ISBN 978-81-321-0424-7.